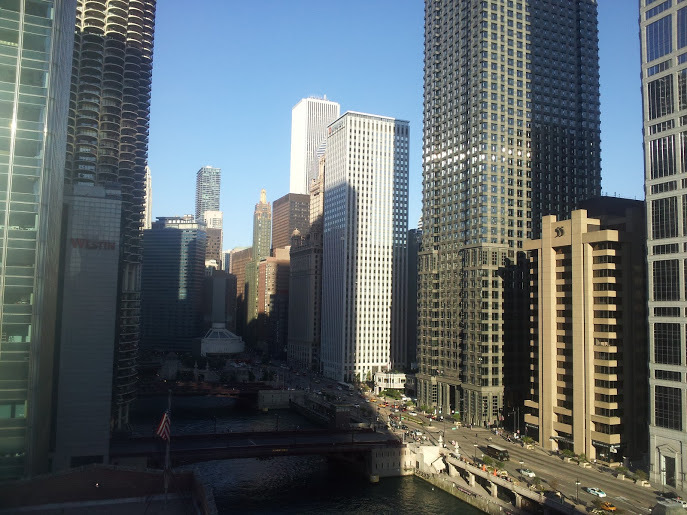 I am involved with a great organization called the Chicago Architecture Foundation (CAF). I’ve been involved since I moved to Chicago nearly 11 years ago. The specific group in the CAF that I am involved with is organized to be a fundraising arm of the umbrella organization. One of the added benefits to being a member of this smaller group is that we get some great behind the scenes tours throughout Chicagoland area. In the past we’ve taken hard hat tours of buildings currently under construction, met with architects and designers to discuss their new projects and gained access to private spaces that are otherwise unreachable to mere mortals. Tuesday night was another event (technically, it was our annual meeting) where we were given a great behind the seasons tour. 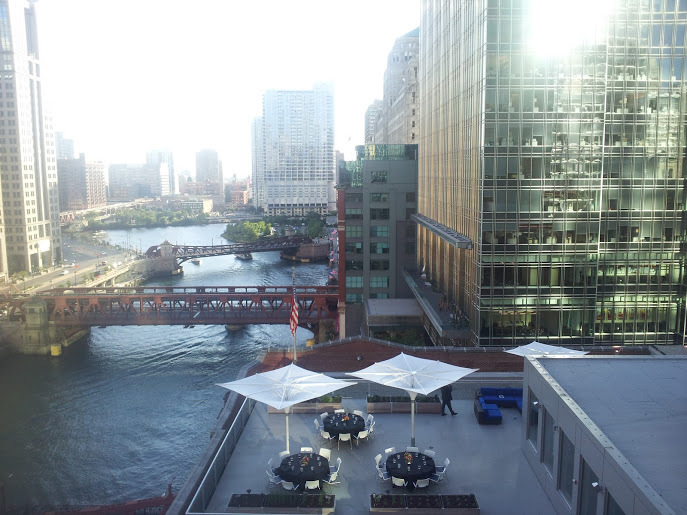 This time we visited the World of Whirlpool Design Center at the Chicago River on LaSalle Street. This building is from 1914 and was the former home Chicago Traffic Court. 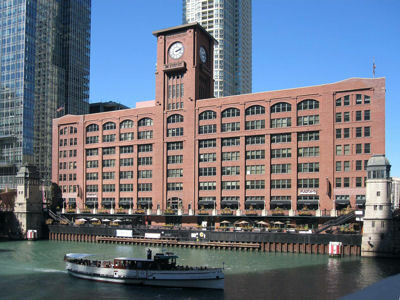 Obviously, the most prominent aspect of this red brick building is the central clock tower. I really love this building – it is surrounded by modern high rises, but sits majestically along the river. 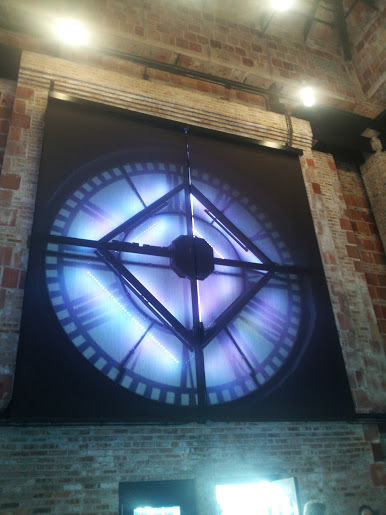 We were able to tour the penthouse space as well as the clock tower. The view of the clock tower from the inside is amazing. 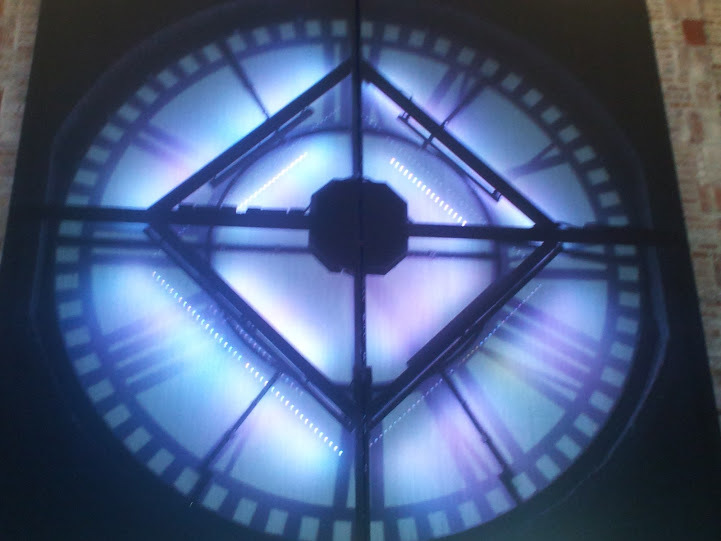 I’ve never seen the inside of a clock tower before – so beautiful. The Design Center also has a great outdoor entertaining space where we had a lovely dinner. 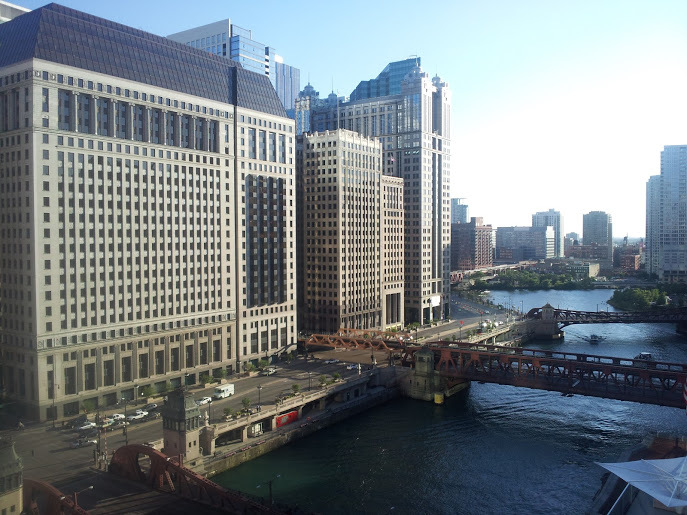 The views of the Loop and the River North area were so great and unique. It might not be the tallest building in the area, but it offers a view that you can’t get anywhere else. Sorry for the poor quality pictures, I had to take these shots with my phone. Why wouldn’t I bring my camera to an event like this? You’d think that after 10 years of taking these amazing once in a life time tours, I’d remember to bring a camera. Oh well, next time. 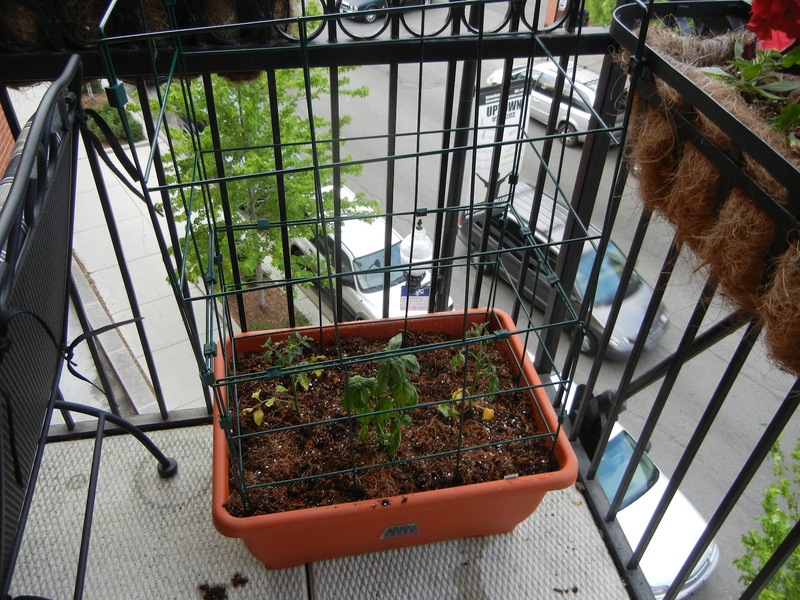 Since I will be traveling quite a bit this summer (read about it here, here, here, here, and here) I decided to outfit my balconies with self watering planters. I hate asking people to come over and water my plants when I am way. I don’t mind asking someone to feed/water Lilly, but plants (interestingly enough) take much more work than Lilly. I did quite a bit of research before I finally pulled the trigger on self watering planters. 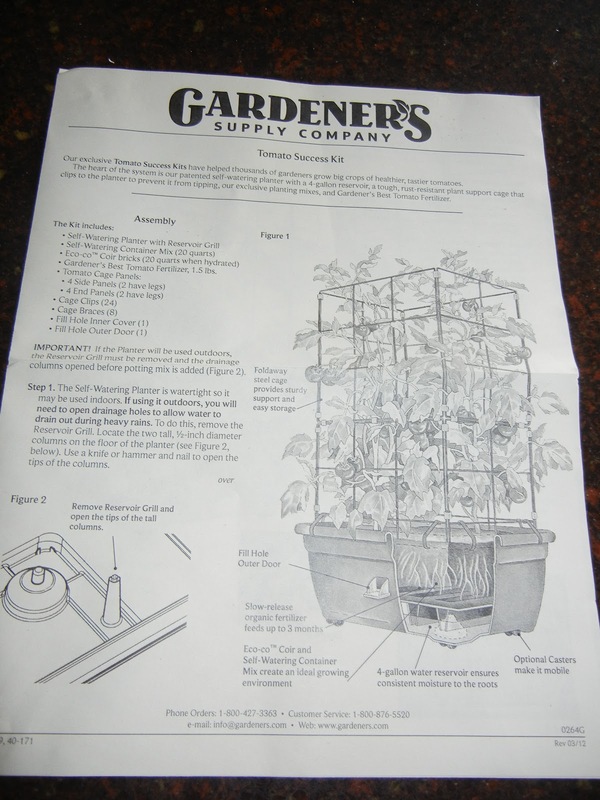 I ended up choosing the Tomato Success Kit from Gardeners Supply Company — actually I ended up choosing two of these. A quick Google search netted me a 15% off coupon and voila, my planters are on their way. 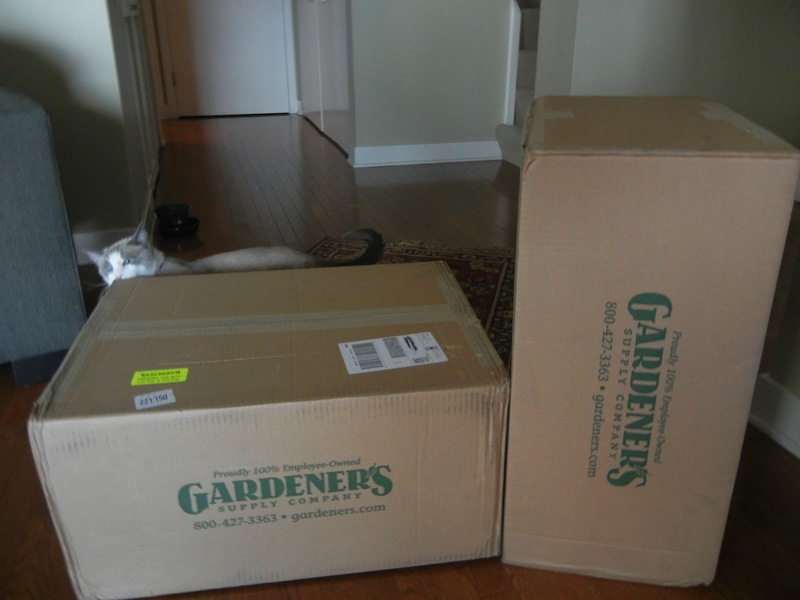 Three business days later these two large boxes arrive. They were surprisingly heavy – 27 pounds in each box. Since the planters are plastic, I couldn’t understand how these things were so freakin’ heavy. 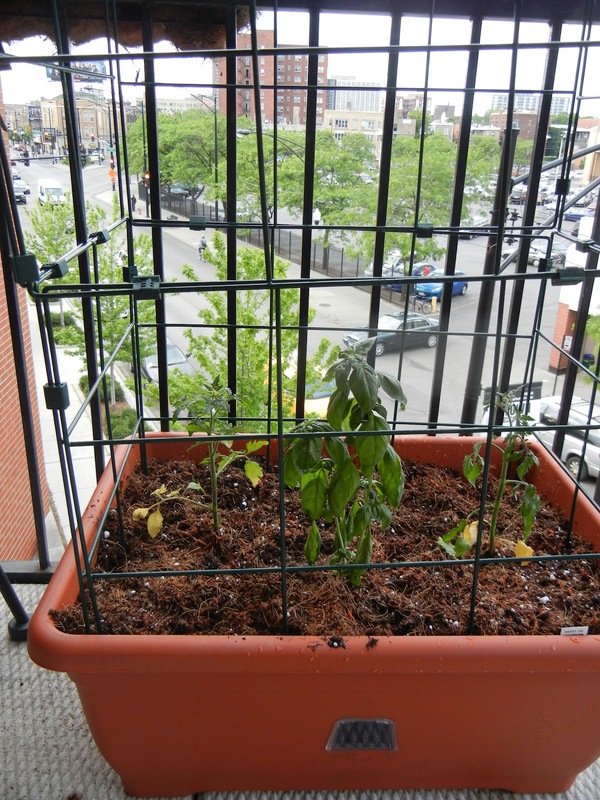 Ah yes — this Success Kit comes complete with the planter, the tomato cage, potting mix, self watering soil and organic tomato fertilizer. I was shocked. I assumed I’d have to go get special dirt on my own. Don’t get me wrong, I’m happy I didn’t have to track down special dirt and schlep it home on he bus, but this doesn’t seem all that efficient, does it? I unpack all the items and read the directions – how strange, I know! The reviews on the website had quite a few complaints about the directions. Specifically the reviews bitched about little detail on the fill spout and the cage assemblies. I must admit, both of these items were pretty straight forward — and I’m not at all handy. Those complaints are completely unfounded. I think Lilly, my cat – pictured above, could put this thing together and she doesn’t have thumbs or the ability to read. 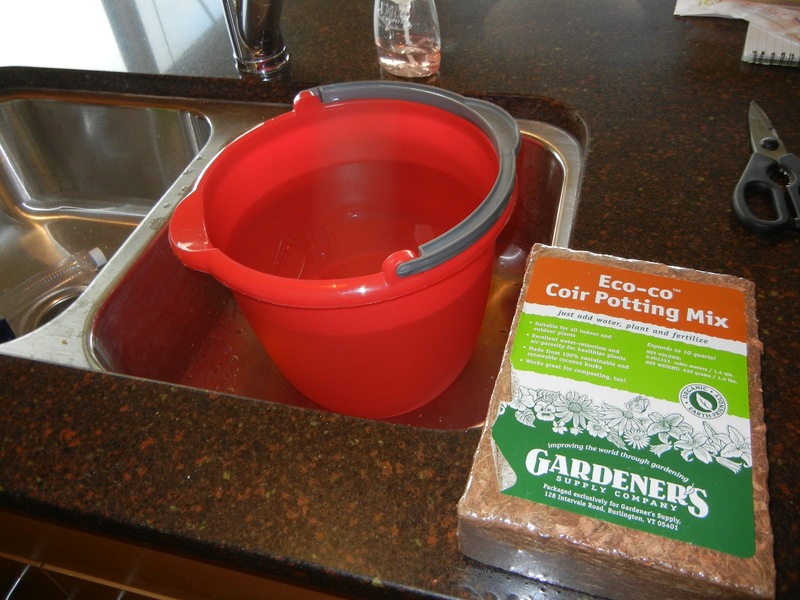 You start by adding the potting mix to a bucket of water and allow the mix to absorb all the water. It is quite surprising how much this mix expanded with water. 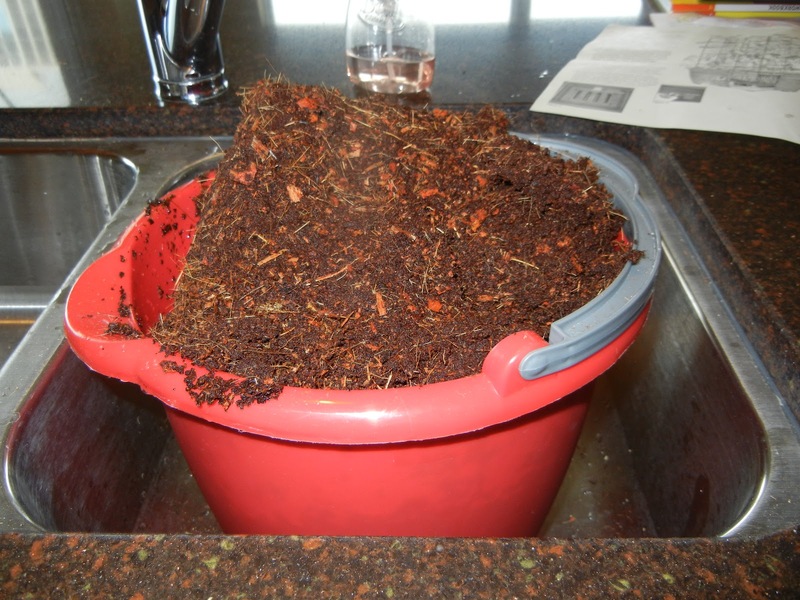 You then mix the waterlogged mix into the soil and the tomato fertilizer and dump it into the big terracotta colored plastic pot. The directions suggest putting one or two tomatoes in this large pot — being the reckless man that I am, put two tomatoes and a basil plant in one and in the other three tomatoes. Wild and crazy I know! The directions suggest you water the traditional way (pour water on top of the dirt) for the first 3-4 weeks until the plants take full root. After that you can water the way the planter was designed to be used. You see in the photos above there is a little plastic pull out spigot where you will the reservoir at the bottom. There is an overflow mechanism in case you overfill or in case it rains heavily — don’t want your tomatoes flooded out do you? So far these have been working well. I’ve been watering the recommended way since I received them and the tomatoes are doing pretty well, but the basil is really thriving. I’ll be sure to provide updates throughout the summer and will compare my yield this year versus last year (last summer I got about 110 cherry tomatoes per plant), I sure hope I do better this year. 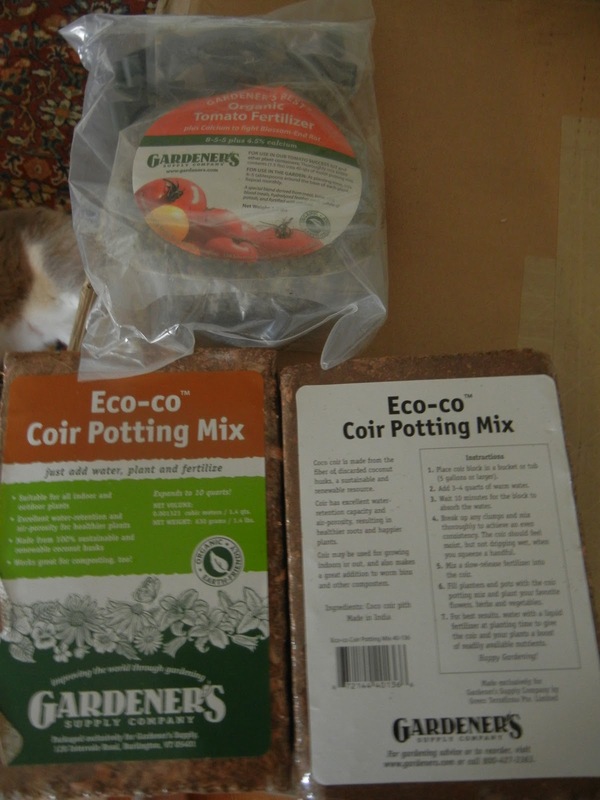 The one thing that annoys me about this item is the number of flies that are attracted to the soil/potting mix. When sitting outside the flies are pretty annoying, but only initially — they fly away and stay away pretty quickly. 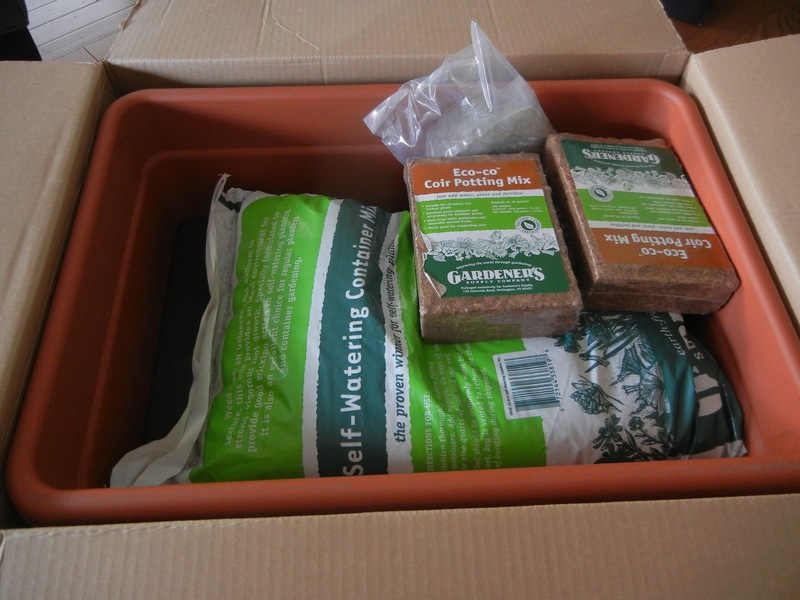 How do you handle your veggie watering while you are away from home? 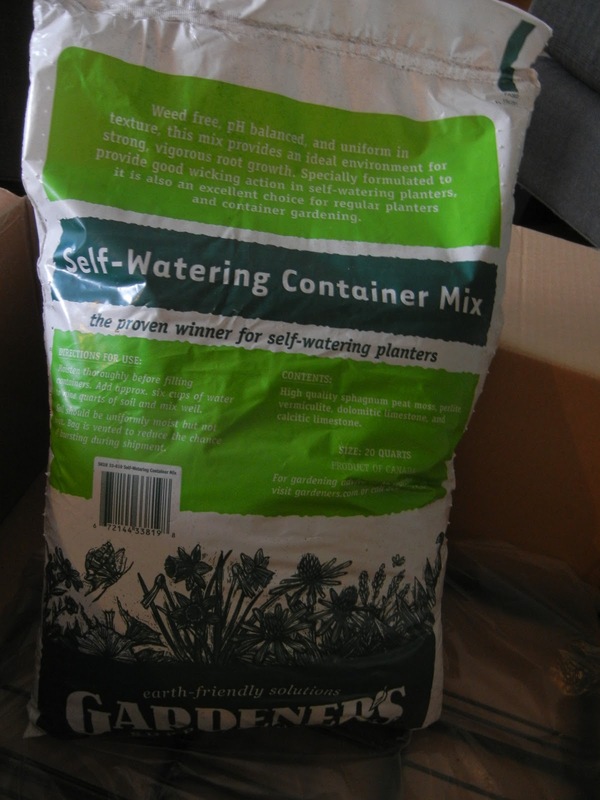 Does the thought of using a plastic planter cause concern (the chemicals leaching into the soil from the heat of the sun)? What else do you plant in your above ground urban planters? 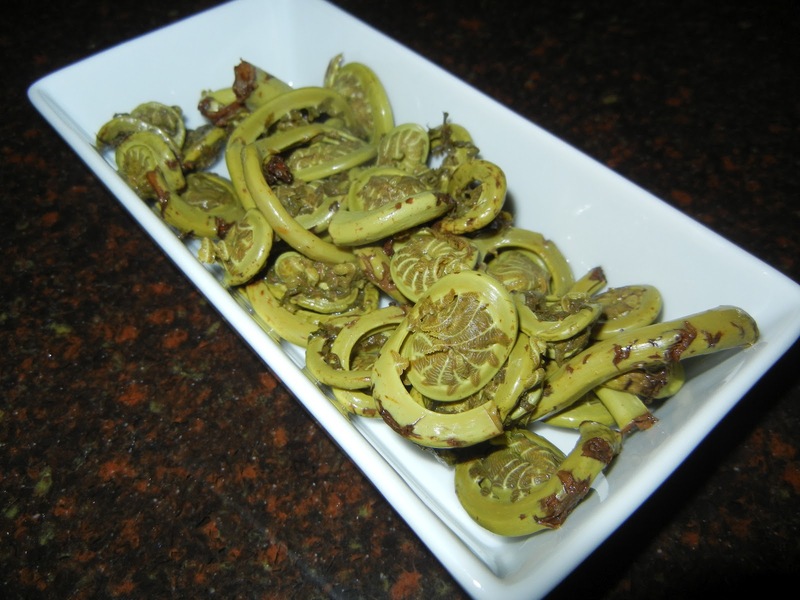 Quick Pickled Fiddlehead Ferns — now that is more of a mouthful. Say that five times fast…go ahead, we’ll wait. Tough, eh? Ok, back to the matter at hand. I had never of heard of fiddlehead ferns until Memorial Day weekend two years ago, but now they are on the menu everywhere. It is even pretty common to find them in higher end grocery stores in Chicago (Whole Foods and Treasure Island, for example). Last time I introduced you all to the fern and talked about a quick way to prepare (you can read that here — it’s just like a haricot vert, but without the haricot). Last weekend we were out celebrating a birthday with a friend and on the charcuterie plate we were presented with pickled fiddlehead ferns. What a great little surprise. I never thought about pickling these things before. One of my goals for the year was to learn how to pickle something — sounds like a great plan for the weekend. The ingredients list is small, but everything is critical. Start by washing the ferns and removing any brown sections (also the fury brown areas should be removed — every time I have purchased ferns they have already been partially cleaned). Salt a pan of water and bring to a boil. Drop the ferns in the boiling water and cook for 1 minute. Plunge the ferns into an ice water bath. Rinse the ferns, plunge again in ice water and rinse again. The ferns will have a beautiful bright green color. Dry the ferns on a cotton towel then place them into a non-reactive (glass or ceramic) bowl. In a separate dish combine the vinegar, salt and sugar until the solids are all dissolved. Pour the vinegar solution over the fiddleheads (in the non-reactive dish), ensuring the ferns are completely covered with liquid (if not add more vinegar – no need to add more salt or sugar). Cover the fiddleheads with plastic wrap or another lid and place in the refrigerator at least 4 hours or overnight. To serve, drain the fiddleheads and serve as an accompaniment to a charcuterie plate or as a regular side dish. The ferns are quite crunchy and have a great color and a refreshingly briny bite. 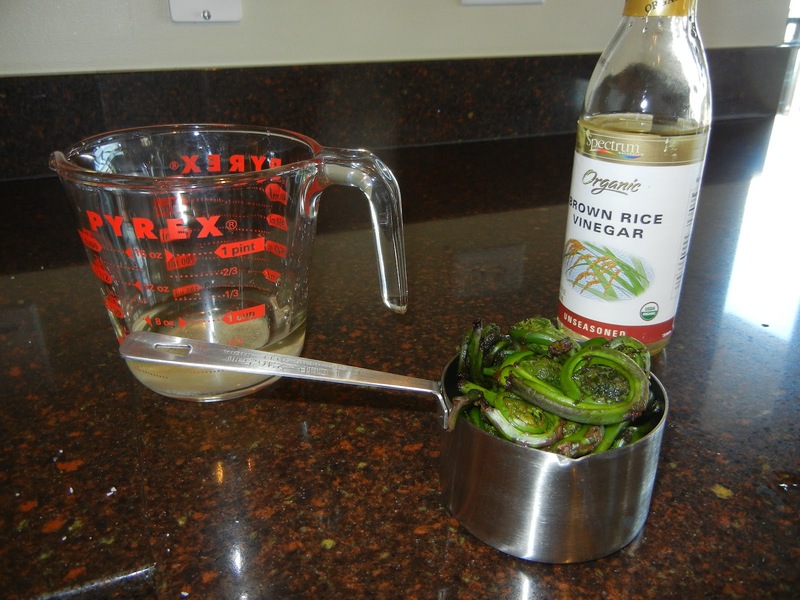 Have you had fiddleheads before? How did you prepare them? Have you tried quick pickling a vegetable this summer? What is your favorite recipe? Do you can your pickled veggies or do you just quick pickle and consume? 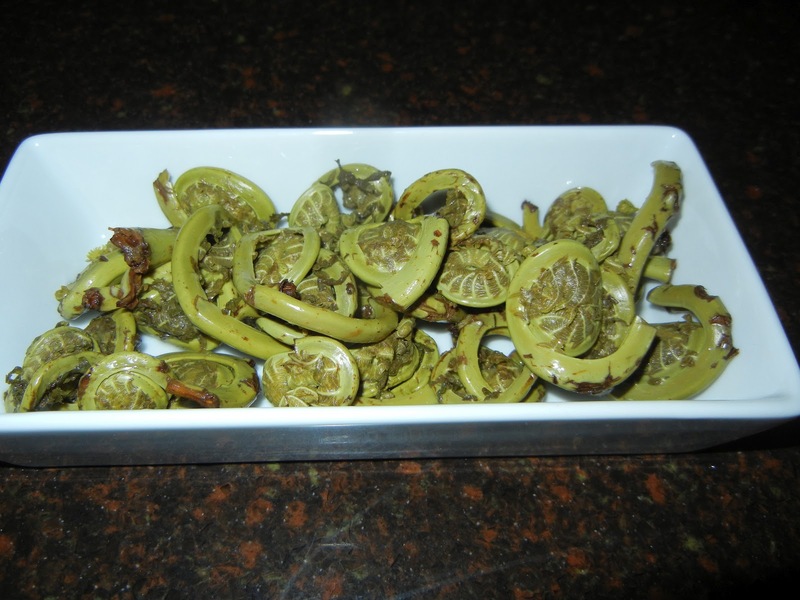 Fiddlehead Ferns – What, you’ve never heard of them? June 11, 2012 05:55 / 1 Comment on Fiddlehead Ferns – What, you’ve never heard of them? Fiddlehead Ferns — wait, are you looking at the screen with your head cocked to one side and a quizzical look in your eyes?. Let me start by saying, I had never even heard of a fiddlehead fern until Memorial Day weekend of 2010. EAD and JFB were in town and we stopped off at a new restaurant who had fiddleheads on the menu. JFB nearly wet himself. MS was quite excited too – mostly because he liked the name. What is a fiddlehead fern you ask? It is the tightly coiled new (furled) frond on a fern (this post is full of tongue twisters, isn’t it?) that is harvested for food. If the frond is left to unfurl it will become a new regular looking leaf/frond on the plant. When harvested they are a delicious addition to your spring/summer dinner plate. In Chicago we can find these at higher end grocery stores (think Whole Foods and Treasure Island). Traditionally you just cook them like a green bean (drop them into a pot of boiling water for 1 minute, remove and plunge into an ice bath). Once the ferns are blanched you can saute them in butter and oil (yes please) maybe with a little garlic and call it good. I’m a firm believer in not over complicating a recipe or a core ingredient – if the food is fresh you should keep it as simple as possible, otherwise you run the risk of ruining the foundation ingredient. Who hasn’t had some mangled piece of fish or shrimp and thought that if they wouldn’t have covered it in an overly complex sauce or cooked it twice it would have been much better. 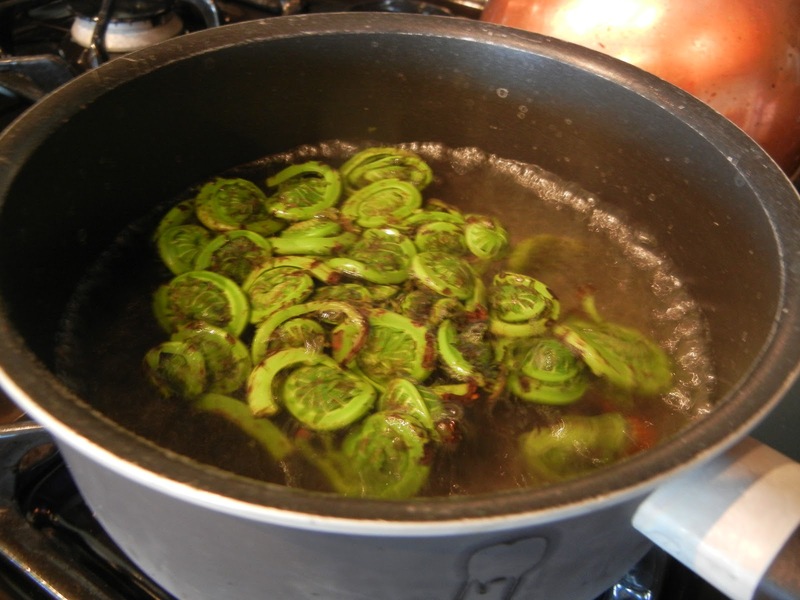 Go to your store and find some fiddlehead ferns for dinner tonight. Like almost everything we eat, there are some guidelines – wash these things thoroughly. You can harvest these yourselves too, but be cautious – some ferns are toxic — if you haven’t foraged for ferns before, don’t do it. We don’t want you to turn out like these people, do you?